Apple Inc. sold more iPhones in China than in the US for the first time ever, while revenue from the US remains ahead of China, for now. China projected to become the company’s largest single market in the near future. First quarter sales of iPhones in China skyrocketed, boosting revenue in the region to $16.8 billion, a 71 percent increase, Apple’s report published Monday said. China swept past Europe’s $12.2 billion revenue, and was still shy of overtaking the Americas $21.3 billion revenue. Sales in China were spurred by the Chinese New Year, which fell in the middle of the first quarter. Sales of the Apple’s flagship iPhone product in ‘Greater China’ – which includes mainland China, Hong Kong, and Taiwan – have already surpassed both Europe and the US. CEO Tim Cook predicated in 2013 that China would one day become the gadget maker’s biggest market, the same year the company partnered with China Mobile, the country and world’s largest cell phone carrier. 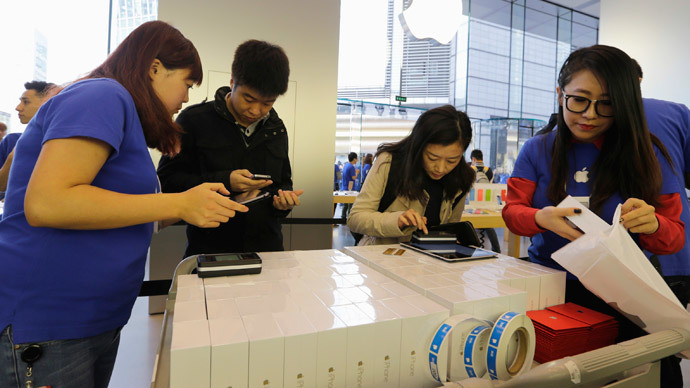 Apple has 21 official stores in the country another 19 are due to open next year. At present, Greater China makes up 29 percent of the tech giant’s sales, and the Americas claim 37 percent. Worldwide, the Cupertino, California company sold 61.2 million iPhones between January and March, making it the second best quarter in company history. Sales of iPhones soared 40 percent up from the same time period last year, but still didn’t match the previous quarter which was on fire with the release of the iPhone 6 and the Christmas holiday season. Sales of Mac computer products increased 31 percent in the same quarter. Apple’s popular new iPhone 6 and 6 Plus helped the company outperform its main rival, South Korea’s Samsung in global smartphone sales. However, while phones were hot, other devices were not. The company’s sales of iPads were sluggish, selling only 12.6 million devices, down 23 percent from a year ago. Analysts mostly agree with Cook’s hypothesis that China will overtake the lucrative US market, but a question remains when Chinese revenues will completely surpass the US. Sales in the coming quarter will likely be on the back of the new Apple Watch- which already has over one million pre-orders in the US.